The President of India Ramnath Kovind expressed his concern about the flood situation in Arunachal during a meeting with CM Pema Khandu and his team. The President also offered his condolence and prayers for the lives lost in landslide in Laptap village. 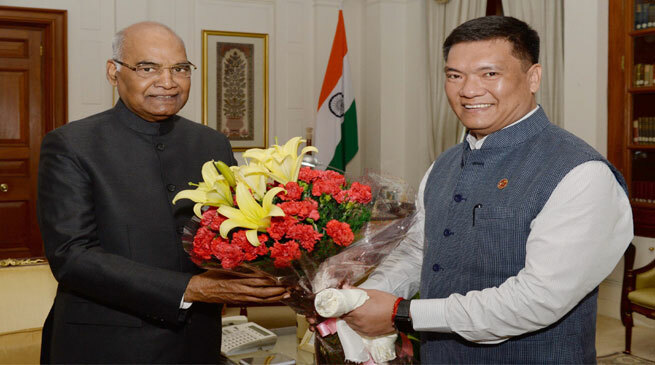 Khandu, accompanied by State BJP President Tapir Gao and Deputy Chief Minister Chowna Mein today called on President Ram Nath Kovind here at Rashtrapati Bhavan. The delegation led by Chief Minister congratulated Kovind on being elected the President of India. He assured to visit Arunachal within this year on a suitable event as promised earlier in his last visit to the state on July. The President advised the leaders from Northeast to work unitedly in promoting the region under the Prime Minister’s ‘Act East Policy’.